Through my experience working with children with autism, on numerous occasions, I witnessed how music could enhance their speech, language and communication skills. Several times I noted that children with very little speech who had been described to me as almost non-verbal, could easily recall words from songs. I carried out research for a PhD at the University of Roehampton on the impact of music on speech and language for children with Autism Spectrum Condition (ASC). The main finding from the interviews were that music can enhance social relationships for children with ASC and that words learnt from song can cross over into real life. Furthermore, the most popular musical activity for children with ASC was singing. Another finding was that there were differences between the ways parents, teachers and music therapists perceived the role music played in the lives of children with ASC. An on-line questionnaire (N=320) based on these findings revealed that nearly one third of children described as non-verbal were reported to sing. Furthermore, for children who spoke at the level of one or two word sentences (as opposed to children described as non-verbal, or children with age appropriate speech), words learned from song were more likely to be used in real life situations. Additionally, for children at the early stages of language acquisition, music was also more likely to enhance social skills and social relationships. Findings from the questionnaire also indicated significant differences between parents and teachers with regard to children’s linguistic and musical abilities. In the comparative intervention, children with ASC (N=24) and a neurotypical comparison group of children from a main-stream primary school (N=32) were asked to recall materials in one of three conditions: words alone, music alone, and words and music together. The results showed distinct subgroups within the autism population: those with a moderate level of expressive language development, for whom music tended to have a positive impact; those with low or high levels of expressive language development, for whom music seemed to have little or no impact. With regard to the neurotypical children, for the children aged 5-7, the music had a positive impact on verbal recall, although for the children aged 8-11, the presence of music had a negative effect. It is not clear why music may enhance language learning for some children with ASC, although three possible reasons have been put forward in the literature with regard to the effects of music on speech and language. Firstly, music and language may share neurological resources, and that exposure to and involvement in music might increase the connectivity of the neural networks involved in the encoding of language. Secondly, the presence of music, or singing as opposed to speaking, may have an arousing effect within the autonomous nervous system. Finally, due to the unique way in which some children with ASC process sound, they may have a natural affinity with music; thus, through a process of association, words have a higher (or more coherent) perceptual profile when linked to melody. A combination of all three of these effects may explain why music can improve language learning for some children with ASC. In sum, these findings provide evidence to show that singing can enhance verbal recall for some children with ASC, and as such, strengthen the claim that music should play a central role in education for children with autism. Parents and teachers should communicate more effectively. My research showed how parents were much more positive than teachers with regard to their children’s linguistic abilities. This is not surprising as parents are likely to be more familiar with the unusual ways in which their children communicate. Therefore they should make teachers more aware of how their children communicate. Nearly a third of non-verbal children sing. Thus for children with very basic language skills, singing can be a fun way to learn new words and can encourage early language acquisition. This also shows some children find it easier to learn words in the form of a song than words in everyday speech, and demonstrates how music can be a powerful tool to improve speech and communication. For 50% of children in my study who could not recollect any words at all when they were narrated in the words only condition, the presence of music helped memory for words. This shows the importance of music in helping children with little language skills learn new words. Music appears to be the most effective for children at the level of one or two word sentences. Therefore especially for these children, encourage them to sing can improve their speech and understanding of words. 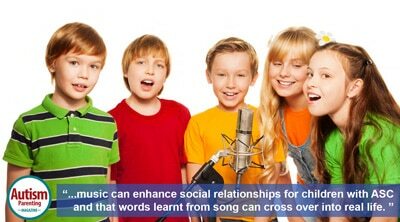 Music can help improve relationships and social skills for children with ASC. This is another reason why musical activities should be encouraged for children with autism. Words learned from songs can cross over into everyday life. So encouraging children to sing can actively increase their vocabulary. This is especially so for children at the level of one or two word sentences. Results from my questionnaire showed that parents and teachers reported that nearly a half of children at this level of linguistic ability used words from song in every-day life. Proactivity – what a child actually does with music. This could involve singing or playing an instrument or percussion either alone or in a group setting. Finally remember music should be an enjoyable experience for your child, so, ultimately, have fun! 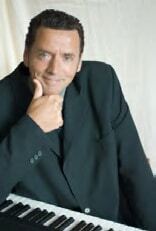 Dr. Adam Reece was born in Manchester and graduated from the University of Manchester with a 2:1 degree in Psychology. On graduation however he moved to Ireland and pursued a musical, as opposed to an academic career, writing and recording original music. When his daughter was born he returned to the UK and began to study for an MSc in Learning Disabilities at the University of Manchester, graduating in 2008. For his dissertation he focused on the impact music has on speech and communication for individuals with special needs. Continuing in this line of research, he enrolled as a candidate for a PhD at the University of Roehampton in the same year. In November 2014 he successfully defended his thesis ‘The interaction between music and language in learning and recall in children with autism spectrum condition.’ He currently works as a pianist and composer, and is also involved in research focusing on the importance of music in education. His thesis will be published within a self-contained chapter of a book edited by Professor Adam Ockelford later in the year, focusing on the impact music has on language for individuals with autism.